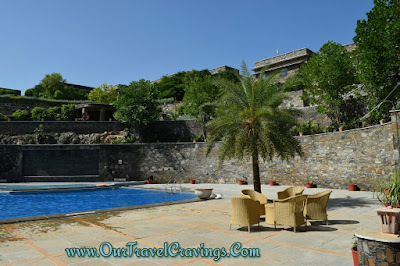 Our Royal experience at Ramada Resort and Spa Udaipur is simply unforgettable. It is not often that we check-in to a hotel and after the refreshing welcome drink we get escorted to our room in a golf-cart! It is not often that we are able to glimpse something like the Sajjangarh fort right from our room window. 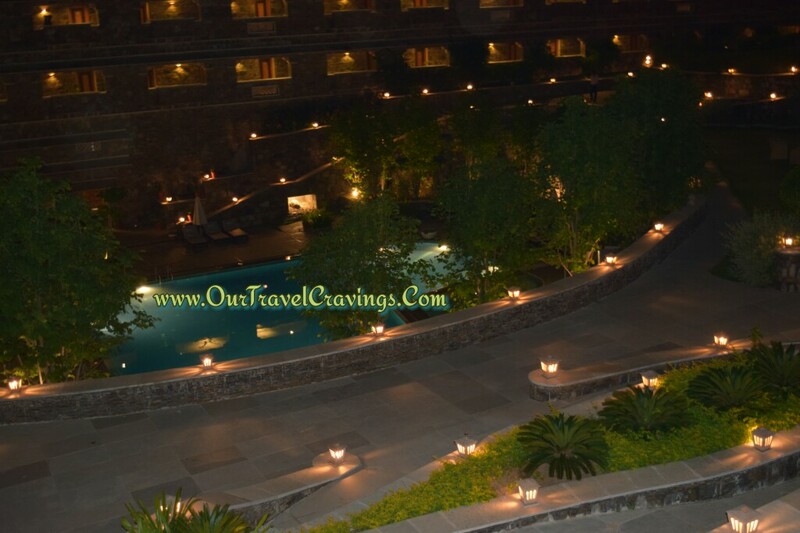 It is not often that we are super-awed by a stone-structured hotel and get flabbergasted by the design and ambience! It is not often that we see a mix of incredible service and supremely comfortable rooms all at the same time. 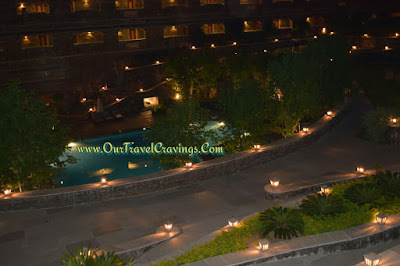 Indeed, if you find all these in one place, it has got to be Ramada Udaipur. 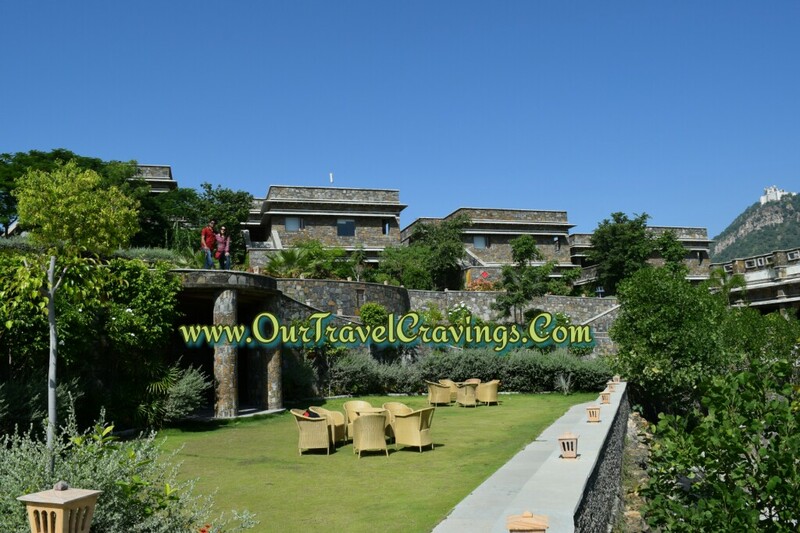 We stayed there just for one night in September 2015 during our Jaipur-Udaipur trip and it was splendid. We craved to stay for one more night but we had our jobs to resume! This place is so awesome that we can be back here anytime in the future! And no, we aren't getting paid to write this! We reached Ramada at around 2 p.m. in the afternoon. The check-in was extremely smooth. No meals were included in our plan. After being golf-carted to our rooms, we confirmed whether the restaurant was open. It was. And we were quite hungry after the train journey. We had travelled from Jaipur to Udaipur in one of the early morning trains having chair cars which took around 8 hours. We had lunch at the hotel itself. The food was delicious but it was a bit heavy on our pockets and hence that was the only meal we had there. Room service was quite quick. And the golf-cart ride was complimentary for any number of pick-up and drops from the reception to the resort room. The surroundings were beautifully decorated and maintained as well. We tried our hands on a few games in the entertainment later that night. It was some fun! Overall, it was a gratifying experience! We would simply rate this hotel a full 5/5 on all grounds! Hope you enjoyed our photos of the flawless design and structure. You can read our experience of sightseeing at Udaipur here. 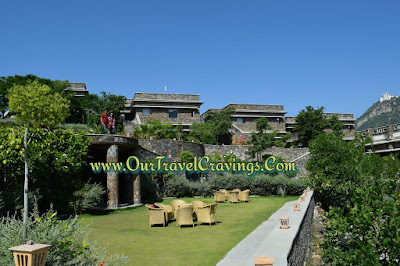 Similarly, you can read our experience at Jaipur here. Please don't hesitate to like, share and subscribe if you liked the review.